Teleology or finality is a reason or explanation for something as a function of its end, purpose, or goal. It is derived from two Greek words: telos (end, goal, purpose) and logos (reason, explanation). A purpose that is imposed by a human use, such as that of a fork, is called extrinsic. Natural teleology, common in classical philosophy but controversial today, contends that natural entities also have intrinsic purposes, irrespective of human use or opinion. For instance, Aristotle claimed that an acorn's intrinsic telos is to become a fully grown oak tree. Though ancient atomists rejected the notion of natural teleology, teleological accounts of non-personal or non-human nature were explored and often endorsed in ancient and medieval philosophies, but fell into disfavor during the modern era (1600–1900). In the late 18th century, Immanuel Kant used the concept of telos as a regulative principle in his Critique of Judgment. Teleology was also fundamental to the philosophy of G. W. F. Hegel. The word teleology builds on the Greek τέλος, telos (root: τελε-, "end, purpose") and -λογία, logia, "speak of, study of, a branch of learning". The German philosopher Christian von Wolff coined the term (in the Latin form "teleologia") in 1728 in his work Philosophia rationalis, sive logica. 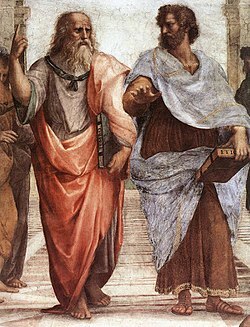 In western philosophy, the term and concept of teleology originated in the writings of Plato and Aristotle. Aristotle's Four Causes give special place to each thing's telos or "final cause." In this, he followed Plato in seeing purpose in both human and sub-human nature. Imagine not being able to distinguish the real cause, from that without which the cause would not be able to act, as a cause. It is what the majority appear to do, like people groping in the dark; they call it a cause, thus giving it a name that does not belong to it. That is why one man surrounds the earth with a vortex to make the heavens keep it in place, another makes the air support it like a wide lid. As for their capacity of being in the best place they could be at this very time, this they do not look for, nor do they believe it to have any divine force, but they believe that they will some time discover a stronger and more immortal Atlas to hold everything together more, and they do not believe that the truly good and 'binding' binds and holds them together. Plato here argues that while the materials that compose a body are necessary conditions for its moving or acting in a certain way, they nevertheless cannot be the sufficient condition for its moving or acting as it does. For example, (given in Phaedo 98), if Socrates is sitting in an Athenian prison, the elasticity of his tendons is what allows him to be sitting, and so a physical description of his tendons can be listed as necessary conditions or auxiliary causes of his act of sitting (Phaedo 99b; Timaeus 46c9–d4, 69e6). However, these are only necessary conditions of Socrates' sitting. To give a physical description of Socrates' body is to say that Socrates is sitting, but it does not give us any idea why it came to be that he was sitting in the first place. To say why he was sitting and not not sitting, we have to explain what it is about his sitting that is good, for all things brought about (i.e., all products of actions) are brought about because the actor saw some good in them. Thus, to give an explanation of something is to determine what about it is good. Its goodness is its actual cause—its purpose, telos or "reason for which" (Timaeus 27d8–29a). It is absurd to suppose that ends are not present [in nature] because we do not see an agent deliberating. Nothing in the body is made in order that we may use it. What happens to exist is the cause of its use. —  Lucretius, De rerum natura (On the Nature of Things), IV, 833; cf. 822–56. Since the Novum Organum of Francis Bacon, teleological explanations in physical science tend to be deliberately avoided in favor of focus on material and efficient explanations. Final and formal causation came to be viewed as false or too subjective. Nonetheless, some disciplines, in particular within evolutionary biology, continue to use language that appears teleological when they describe natural tendencies towards certain end conditions; although some argue that these arguments ought to be, and practicably can be, rephrased in non-teleological forms, others hold that teleological language cannot always be easily expunged from descriptions in the life sciences, at least within the bounds of practical pedagogy. This is discussed further below. A teleology of human aims played a crucial role in the work of Ludwig von Mises especially in the development of his science of praxeology. More specifically he believed that human action, i.e. purposeful behavior, is teleological based on the presupposition that an individual's action is governed or caused by the existence of their chosen ends. Or in other words an individual selects what they believe to be the most appropriate means to achieve a sought after goal or end. Mises however also stressed that teleology with respect to human action was by no means independent of causality as he states "no action can be devised and ventured upon without definite ideas about the relation of cause and effect, teleology presupposes causality"
Individual human consciousness, in the process of reaching for autonomy and freedom, has no choice but to deal with an obvious reality: the collective identities (such as the multiplicity of world views, ethnic, cultural and national identities) that divide the human race and set (and always have set) different groups in violent conflict with each other. Hegel conceived of the 'totality' of mutually antagonistic world-views and life-forms in history as being 'goal-driven', that is, oriented towards an end-point in history. The 'objective contradiction' of 'subject' and 'object' would eventually 'sublate' into a form of life that leaves violent conflict behind. This goal-oriented, 'teleological' notion of the 'historical process as a whole' is present in a variety of 20th-century authors, although its prominence declined drastically after the Second World War. In contrast, teleological based "grand narratives" are eschewed by the postmodern attitude and teleology may be viewed as reductive, exclusionary and harmful to those whose stories are diminished or overlooked. Against this postmodern position, Alasdair MacIntyre has argued that a narrative understanding of oneself, of one's capacity as an independent reasoner, one's dependence on others and on the social practices and traditions in which one participates, all tend towards an ultimate good of liberation. Social practices may themselves be understood as teleologically oriented to internal goods, for example practices of philosophical and scientific inquiry are teleologically ordered to the elaboration of a true understanding of their objects. MacIntyre's book After Virtue famously dismissed the naturalistic teleology of Aristotle's 'metaphysical biology', but he has cautiously moved from that book's account of a sociological teleology toward an exploration of what remains valid in a more traditional teleological naturalism. Teleology informs the study of ethics. Business people commonly think in terms of purposeful action as in, for example, management by objectives. Teleological analysis of business ethics leads to consideration of the full range of stakeholders in any business decision, including the management, the staff, the customers, the shareholders, the country, humanity and the environment. Teleology provides a moral basis for the professional ethics of medicine, as physicians are generally concerned with outcomes and must therefore know the telos of a given treatment paradigm. The broad spectrum of consequentialist ethics, of which utilitarianism is a well-known example, focuses on the end result or consequences, with such principles as utilitarian philosopher John Stuart Mill's "the greatest good for the greatest number", or the Principle of Utility. Hence, this principle is teleological, but in a broader sense than is elsewhere understood in philosophy. In the classical notion, teleology is grounded in the inherent natures of things themselves, whereas in consequentialism, teleology is imposed on nature from outside by the human will. Consequentialist theories justify inherently what most people would call evil acts by their desirable outcomes, if the good of the outcome outweighs the bad of the act. So, for example, a consequentialist theory would say it was acceptable to kill one person in order to save two or more other people. These theories may be summarized by the maxim "the ends can justify the means." Consequentialism stands in contrast to the more classical notions of deontological ethics, such as Immanuel Kant's Categorical Imperative, and Aristotle's virtue ethics (although formulations of virtue ethics are also often consequentialist in derivation). In deontological ethics, the goodness or badness of individual acts is primary and a desirable larger goal is insufficient to justify bad acts committed on the way to that goal, even if the bad acts are relatively minor and the goal is major (like telling a small lie to prevent a war and save millions of lives). In requiring all constituent acts to be good, deontological ethics is much more rigid than consequentialism, which varies by circumstances. Practical ethics are usually a mix of the two. For example, Mill also relies on deontic maxims to guide practical behavior, but they must be justifiable by the principle of utility. In modern science, explanations that rely on teleology are often, but not always, avoided, either because they are unnecessary or because whether they are true or false is thought to be beyond the ability of human perception and understanding to judge. But using teleology as an explanatory style, in particular within evolutionary biology, is still controversial. Apparent teleology is a recurring issue in evolutionary biology, much to the consternation of some writers. Statements implying that nature has goals, for example where a species is said to do something "in order to" achieve survival, appear teleological, and therefore invalid. Usually, it is possible to rewrite such sentences to avoid the apparent teleology. Some biology courses have incorporated exercises requiring students to rephrase such sentences so that they do not read teleologically. Nevertheless, biologists still frequently write in a way which can be read as implying teleology even if that is not the intention. These issues have recently been discussed by John Reiss. [page needed] He argues that evolutionary biology can be purged of such teleology by rejecting the analogy of natural selection as a watchmaker; other arguments against this analogy have also been promoted by writers such as Richard Dawkins. Some authors, like James Lennox, have argued that Darwin was a teleologist, while others like Michael Ghiselin described this claim as a myth promoted by misinterpretations of his discussions and emphasized the distinction between using teleological metaphors and being teleological. Biologist philosopher Francisco Ayala has argued that all statements about processes can be trivially translated into teleological statements, and vice versa, but that teleological statements are more explanatory and cannot be disposed of. Karen Neander has argued that the modern concept of biological 'function' is dependent upon selection. So, for example, it is not possible to say that anything that simply winks into existence without going through a process of selection has functions. We decide whether an appendage has a function by analysing the process of selection that led to it. Therefore, any talk of functions must be posterior to natural selection and function cannot be defined in the manner advocated by Reiss and Dawkins. Ernst Mayr states that "adaptedness... is an a posteriori result rather than an a priori goal-seeking." Various commentators view the teleological phrases used in modern evolutionary biology as a type of shorthand. For example, S. H. P. Madrell writes that "the proper but cumbersome way of describing change by evolutionary adaptation [may be] substituted by shorter overtly teleological statements" for the sake of saving space, but that this "should not be taken to imply that evolution proceeds by anything other than from mutations arising by chance, with those that impart an advantage being retained by natural selection." J. B. S. Haldane said, "Teleology is like a mistress to a biologist: he cannot live without her but he's unwilling to be seen with her in public." Julian Bigelow, Arturo Rosenblueth, and Norbert Wiener have conceived of feedback mechanisms as lending a teleology to machinery. Wiener, a mathematician, coined the term 'cybernetics' to denote the study of "teleological mechanisms." Cybernetics is the study of the communication and control of regulatory feedback both in living beings and machines, and in combinations of the two. In the cybernetic classification presented in "Behavior, Purpose and Teleology", teleology is feedback controlled purpose. The classification system underlying cybernetics was criticized by Frank Honywill George, who cited the need for an external observability to the purposeful behavior in order to establish and validate the goal-seeking behavior. In this view, the purpose of observing and observed systems is respectively distinguished by the system's subjective autonomy and objective control. ^ Mahner, Martin; Bunge, Mario (2013-03-14). Foundations of Biophilosophy. Springer Science & Business Media. ISBN 9783662033685. ^ a b "CATHOLIC ENCYCLOPEDIA: Teleology". www.newadvent.org. Retrieved 2018-06-19. ^ Júnior, Paulo Pereira Martins; Vasconcelos, Vitor Vieira (2011-12-09). "A teleologia e a aleatoriedade no estudo das ciências da natureza: sistemas, ontologia e evolução" [Teleology and randomness in the study of the natural sciences: systems, ontology and evolution]. Revista Internacional Interdisciplinar INTERthesis (in Portuguese). 8 (2): 316–334. doi:10.5007/1807-1384.2011v8n2p316. ISSN 1807-1384. ^ Thomas Nagel, Mind and Cosmos, Oxford University Press: 2012. ^ Eric Partridge, Origins: A Short Etymological Dictionary of Modern English, Routledge, 1977, p. 4187. ^ Wolff, Christian (1728). Philosophia Rationalis Sive Logica: Methodo Scientifica Pertractata Et Ad Usum Scientiarum Atque Vitae Aptata. Frankfurt and Leipzig (published 1732). Retrieved 2014-11-20. ^ Aristotle. The Organon and Other Works. Opensource collection. Translated under the editorship of W.D. Ross. Full text at Internet Archive (archive.org). p. 649 in text. n647 in page field. Retrieved 2009-10-22. ^ Aristotle. The Organon and Other Works. pp. 640–644 in text. n639–643 in page field. Retrieved 2009-10-22. ^ a b "The received intellectual tradition has it that, in the sixteenth and seventeenth centuries, revolutionary philosophers began to curtail and reject the teleology of the medieval and scholastic Aristotelians, abandoning final causes in favor of a purely mechanistic model of the Universe." Ransom Johnson, Monte (2008), Aristotle on Teleology, Oxford University Press pp. 23–24. ^ kanopiadmin (18 August 2014). "The Ultimate Foundation of Economic Science". Mises Institute. ^ Jean-François Lyotard, The Postmodern Condition: A Report on Knowledge (1979). ^ Leonard J. Brooks, Paul Dunn (2009-03-31). "Business & Professional Ethics for Directors, Executives & Accountants". Cengage Learning: 149. ISBN 978-0-324-59455-3. ^ Jeremy Sugarman, Daniel P. Sulmasy (2001). Methods in medical ethics. Georgetown University Press. p. 78. ISBN 978-0-87840-873-3. ^ John Gray, Ed. (1998). John Stuart Mill On Liberty And Other Essays. Oxford University Press. p. ix. ISBN 0-19-283384-7. ^ a b Hanke, David (2004). "Teleology: The explanation that bedevils biology". In John Cornwell (ed.). Explanations: Styles of explanation in science. Oxford & New York: Oxford University Press. pp. 143–155. ISBN 0-19-860778-4. Retrieved 18 July 2010. ^ Lennox, James G. (1993). "Darwin was a Teleologist" Biology and Philosophy, 8, 409-21. ^ Ghiselin, Michael T. (1994). "Darwin's language may seem teleological, but his thinking is another matter". Biology and Philosophy. 9 (4): 489–492. doi:10.1007/BF00850377. ^ Ayala, Francisco (1998). "Teleological explanations in evolutionary biology." Nature's purposes: Analyses of Function and Design in Biology. The MIT Press. ^ Neander, Karen (1998). "Functions as Selected Effects: The Conceptual Analyst's Defense," in C. Allen, M. Bekoff & G. Lauder (Eds. ), Nature's Purposes: Analyses of Function and Design in Biology (pp. 313–333). Cambridge, MA; London, UK: The MIT Press. ^ Madrell SHP (1998) Why are there no insects in the open sea? The Journal of Experimental Biology 201:2461–2464. ^ Hull, D., Philosophy of Biological Science, Foundations of Philosophy Series, Prentice–Hall, Englewood Cliffs, N. J., 1973. ^ Mayr, Ernst (1974) Boston Studies in the Philosophy of Science, Volume XIV, pp. 91–117. ^ Maley, Corey J.; Piccinini, Gualtiero (2018-01-18). "A Unified Mechanistic Account of Teleological Functions for Psychology and Neuroscience". Oxford Scholarship Online. doi:10.1093/oso/9780199685509.003.0011. ^ Rosenblueth, Arturo; Wiener, Norbert; Bigelow, Julian (Jan 1943). "Behavior, Purpose and Teleology". Philosophy of Science. 10 (1): 21. doi:10.1086/286788. JSTOR 184878. ^ Conway, Patrick (1974). Development of volitional competence. MSS Information Corp. p. 60. ISBN 0-8422-0424-5. ^ George, Frank Honywill; Johnson, Les (1985). Purposive behavior and teleological explanations. Gordon and Breach. pp. xII.